The class is an attribute which specifies one or more class names for an HTML element. The class attribute can be used on any HTML element. 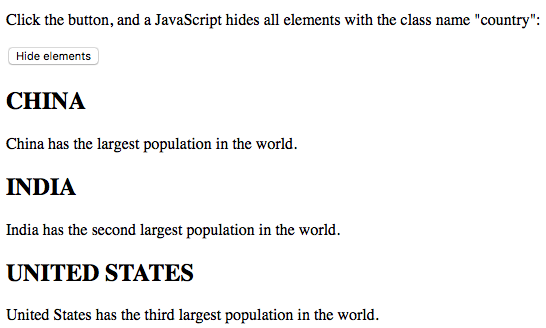 Explanation: In the above example CSS styles all elements with the class name “country”. HTML elements can have more than one class name, where each class name must be separated by a space. Explanation: All three headers have the class name “country”, but in addition to that, CHINA also has the class name “middle”, which makes the text center aligned. Different tags, like <h2> and <p>, can have the same class name and thereby share the same style. Explanation: Even if the two elements do not have the same tag name, they can have the same class name, and get the same styling.